If we told you the bike pictured above is an E-bike, would you believe us? If your guess was based on visuals alone, you would probably say no. This response is exactly what Orbea set out to achieve with the new 2019 Gain E-bike. If you are part of the cycling community, I’m sure you’re aware of the stigma that surrounds E-bikes. Uneducated cycling purists view them essentially as mini electric motorcycles. This couldn’t be further from the truth, especially with the Gain M20 USA. The Gain M20 is still a bike through and through. It doesn’t have a throttle and the electric assist is only there to help you get up those extra steep grades and allow you to hang with your slightly faster friends. 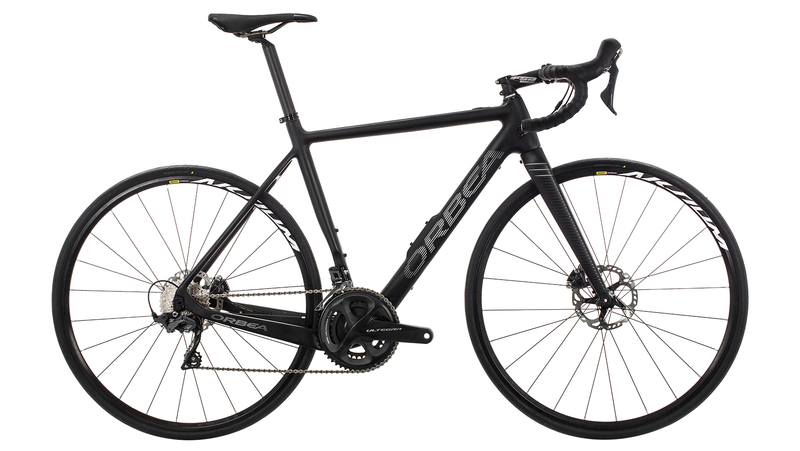 If you are looking for a bike that looks clean and will give you a slight edge, the Orbea Gain was made for you. Every detail of the Gain M20 was designed with the rider and superior ride quality in mind. From different length crank arms, stems, and handlebars depending on frame size, to powerful hydraulic disc brakes that provide excellent stopping power and modulaton, the Orbea Gain is a bike you can have the utmost confidence in. Even the smallest details such as an e-bike specific chain were considered when constructing the build for this bike. A Shimano Ultegra R8000 groupset brings the whole bike together with its renowned durability and performance. What might be the most impressive feature of the Gain M20 is the weight at just 26.5 lbs. This is achieved by the ultra-light weight Ebikemotion drive system, weighing less than 8 lbs. total. The Gain is light enough to be ridden without the electric assist while not feeling burdened by the additional weight of the motor and battery. The motor will assist you up to 20 miles/hour and provides 40 N.m of torque. The perfect amount of power to help you finish your climb or catch up to your friends. Plus, unlike other e-bikes, Orbea seamlessly hid the battery in the downtube and opted for a hub drive motor perfectly hidden between the cassette and rear brake rotor. You won’t feel the stigma of an E-bike when no one knows you have one. Orbea created the Gain for any rider who needs a little extra boost but doesn’t want to sacrifice weight and perception. The Gain M20 USA is a clean and proper looking road bike with an exceptional build kit that just happen to have a little power in the back. If you are looking for a slight edge but don’t want to give up your fitness or appearance, the Orbea Gain is perfect for you.